The brutal and harsh measures against protesting students at Quaid-e-Azam University, Islamabad have again unleashed the true nature of the fragile Pakistani State. The Quaid-e-Azam University (QUA) is one of the more prestigious public institutions in the country and attracts large number of students from all over Pakistan. Since the Zia Ul Haq period (1977-1988) a ban has been imposed upon student unions; the student movement has been so harshly crushed that genuine voices for rights are rarely found. In major institutions of the country, fascist goons in the form of Jamiat, APMSO, MSF and similar groups are installed by the state to crush the students’ rights movement. However despite of these dirty tactics, the ruling class has failed to completely wipe out resistance. The QUA students movement has been a marvelous example of students struggle in recent years. Through their organization Quaid-e-Azam Students Federation (QSF) they have fought back against the brutality of both university management and the Pakistani state. In recent years there has been a continuous increase in tuition fees and lodging costs which are it making it increasingly difficult for students to complete their studies. After years of oppression and continuous attacks from university management students decided to fight back. The management expels and suspends students if anyone is found even slightly found raising their voice against teacher or management. On 4th October 2017, students under leadership of QSF started a strike against university management and put forward their 12 demands. Their main demand was the immediate reinstatement of all expelled and suspended students. Other demands included revision of fee structure, increase in the number of hostels and buses, reimbursement of heavy fines, improvement in facilities for students, removal of security blockades, registration of pharmacy department and inquiry against the RO and provost. The corruption and behavior of Vice-Chancellor Javed Ashraf provoked the current strike. It came to be known that the student’s endowment fund worth 160 Million Rupee was invested in Dubai Islamic Bank;.QSF alleged Ashraf’s corruption relating to the fund. Many teachers also criticized Ashraf for extracting profits for his own benefits rather for students' wellbeing. In these two weeks students brought academic activities at the University to a complete halt, and the University was completely shut down. They held a sit-in and vowed to carry on the struggle until their demands were met. Another other shining aspect of this strike was the co-operation of students belonging to different nationalities. Baloch, Sindhi, Punjab, Kashmiris and Urdu speaking etc raised banner based upon class; all prejudices in form of language, nationality, religion, gender etc were wiped out during the strike. Women students were also at the forefront if this battle. International media portrays Pakistan as a conservative society however the fighting spirit of women students at QUA challenges this narrative. After two weeks of splendid struggle, on 21st October, 2017 it appeared that management agreed to meet demands. They issued an order for cancellation of a previous notification raising fees by 10% fees and accepted most demands. Using the tactic of divide and rule, university management did not accept reinstatement of suspended and expelled students. Among them mostly were Baluchi and Sindhi, here management used neoliberal policies of their former masters (British) to use national question to take back everything that had been agreed upon earlier. Management backed by the state unleashed worst kind of torture on students in order to restore peace. On 23rd October, major newspaper of Pakistan DAWN reported that, “Cracking down on students protesting against the Quaid-e-Azam University (QAU) administration, Islamabad police arrested 70 students on Monday in a bid to reopen the university, which has remained closed for over two weeks due to a student-admin showdown.” Although QSF & other organizations called off the strike after notification from management, the Baloch council continued their protest and defies all dirty tactics of management. Baloch Council Chairman Kamran Baloch and other students allege that Baloch students are being victimized by the university administration. The council demanded that expelled Baloch students, including the council chairman be restored. This week, university management agreed to all demands, and re-instated every student marking a successful end to the struggle. 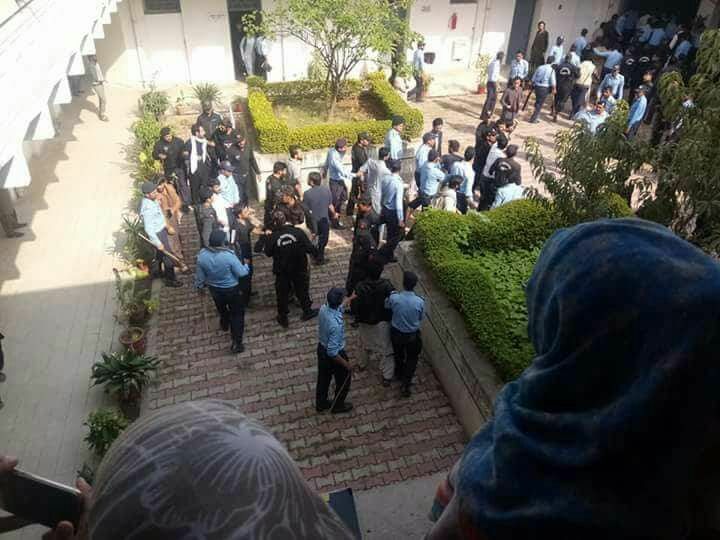 The sparks of rebellion are present everywhere, by taking inspiration from QUA large number of women students started protest at Islamic University, Islamabad against conservative policies of management. Female students protested over the restrictive campus atmosphere and unnecessary restrictions introduced by the administration for them. They alleged that male students are free at their own will, however female students are not allowed to leave campus before day end and without showing permission slips to guards at the gates. They rallied and staged a sit-in on one of the main roads in the heart of the university. “Uber and Careem are drivers, not our boyfriends” screamed one placard. Similarly, in Peshawar University students protested against a fee hike. At Indus Institute DG Khan students are were protesting for authenticity of their degrees. We have seen barbaric murder of Mashal Khan of Abdul Wali Khan University, Mardan who stood for student’s right and was a vocal voice against brutality of management. Management staged his killing on accusation of “fake allegations of posting blasphemous content online”, he was mercilessly killed by an angry mob. We have seen mass protests all over the country against this incident. In the case of QUA and others we have seen no single union/organization organizing students and divisions within the student have allowed the state to take advantage in order to crush movements. In QUA QSF is not a homogenous organization but rather it is composed of 5-6 ethnic base councils. At majority of educational institutions throughout Pakistan, students are organised based upon nationalities or language. Like Saraiki Council, Baluch council has been formed by students to safeguard rights of their own community. Although during strike action these are councils are united against a common enemy, management is able to exploit ethnic divisions and can easily break unity. Pakistan has a marvelous background of revolutionary struggle including the 1968 movement. When student Abdul Hameed was killed by police fire it sparked students of the whole country. From Islamabad to Dhaka there was students protest everywhere, later on the working class joined and we saw toppling of Ayub Khan, army dictator and the creation of workers’ councils. The ruling class has tried to vanish away the traditions of revolutionary struggle, but the student movement is alive and it will bring changes in the near future.